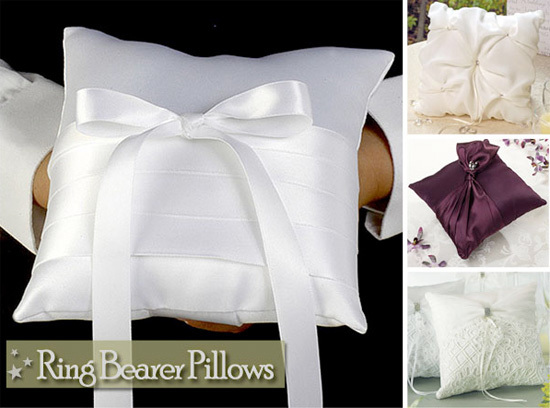 The two most recognized accessories used during the wedding ceremony are the flower girl basket and ring bearer pillow. Aside from the bride and groom the flower girl and ring bearer tend to get the most attention; who can resist a little one all dressed up! Too cute! So be sure to give the little ones an accessory that matches their attire or your wedding theme. The Wedding Outlet has the perfect variety of flower girl baskets for the little lady in your wedding. You'll find a wide range of baskets in many colors, sizes and styles. Choose from very simple to intricate baskets made of satin, silk, organza or chiffon. The Wedding Outlet also has a selection of colorful rose petals to toss during the ceremony. The Wedding Outlet also has the perfect ring bearer pillows for the little guy in your wedding. Ring pillows are offered in a variety of styles from traditional to contemporary. You can choose a ring pillow to match your bridal gown or select one that matches the colors of your bridesmaid dresses. Get creative and try a heart-shaped pillow, personalized pillow and or a unique ring bearer pillow. The wedding ceremony will be the most memorable part of the day and you can add just the right special touch with a perfect flower girl basket and ring bearer pillow. Be sure to visit The Wedding Outlet for other wedding ceremony essentials including aisle runners, unity candles, sand ceremony kits, wedding programs and much more.